Morphie has introduced a new battery case called Juice Pack Air which facilitates wireless charging in iPhone 7 and iPhone 7 Plus. Till now Apple has not launched wireless charging with any of its iPhones. hence, Morphie’s wireless charging battery case is a welcome accessory. 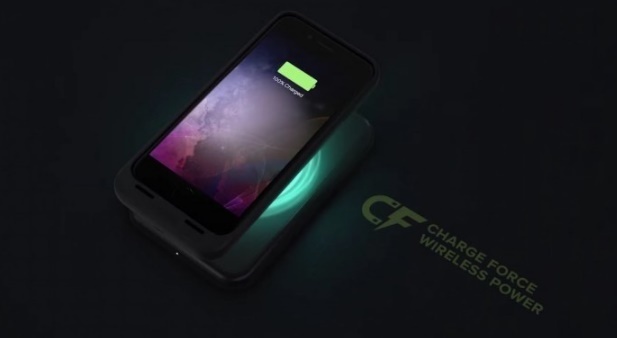 The wireless charger incorporated in the battery case will be deploying Charge Force wireless charging and also Qi-compatible. Mophie’s Juice Pack Air, as the battery case is called, is available for iPhone 7 and iPhone 7 Plus. The iPhone 7 variant packs in a 2,525mAh battery which suffices for a total of 27 hours according to the company. The iPhone 7 Plus variant has a 2,420mAh battery for a total of 33 hours. One of the prominent features of Juice Pack is its prioritizing ability. It prioritized iPhone charging to highest. This means it will charge your iPhones first and then recharge itself. As the case comes with charging facility, it’s obvious that the case will add some weight to the device as a whole and adds a raised lip around your display for added protection and the convenience of wireless. This feature may not seem appealing to many but co sidering the advantage it will provide, it’s commendable. The Juice Pack Air case also has four LED power indicators on the back display how much charge is left. As iPhone 7 and 7 Plus has ditched headphone jack, so has Juice pack Air. The case is available in several vibrant colors such as black, gold, blue, rose gold and red. The device is priced at $99 (or £89.95 in the UK). The black color is available in the US market now with other colors available in following weeks, while the UK can only pre-order for now.